Is LottoZone a Scam or Legit? Read Reviews! I’m still not sure why the team targeted Lottozone.com today but I guess the name made them all figure this was a online lotteries site. It definitely is not. Lottozone.com is a gambling site for a variety of casino games including Monday Madness (okay I like that name), Live Dealer Multi Hand Live Roulette and The Dark Knight Rises. They have five different areas of play including slots, jackpots, scratch, casino & live and mobile. They promote their own games and encourage people to consider a different way of putting their luck to the test. I was not convinced at first but thought I’d take a look. One of the most frustrating things about Lottozone.com is, it didn’t seem to matter what we clicked, we ended up at progressplay.net. Once onto that site, the only way to get further information was to complete the registration process. Progress Play is a company registered out of Malta. 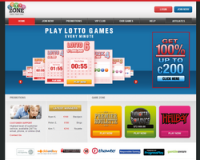 They have an affiliate lottery.co.uk that does offer access to play online lotteries, but that’s not apparent at the Lottozone.com site. I started thinking about the whole concept of winning and playing games online. Don’t get me wrong – I prefer playing lotteries, but some of the names of the different games offered at Lottozone.com did catch my eye. It all comes down to a game of chance though I have a feeling I might get a little carried away playing Roulette online. The big difference is lotteries means waiting for a draw, where Casino games are immediate. Lottozone.com says it has 250 casino games with on the PC version and more than 20 on the smartphone and iPad versions. The vast majority of them seem to award prizes that never climb above four digits, but then this is gambling and not the place to play big jackpot lotteries. They do seem to have better odds compared to Powerball, Mega Millions or EuroMillions but then again, the higher the jackpot, the more challenging the odds. Lottozone.com’s VIP Club does offer some great discounts and bonuses based on the more you play. This includes birthday and anniversary bonuses. They have five levels which a player rises through depending on how much they spend. Our team couldn’t find any complaints, but then again, this is an online casino with quick wins or losses. This is a pretty clean site that doesn’t junk it up with making all kinds of statements about winners. It’s supported by both live chat and an online form both claiming to be 24/7. Our team took turns popping them to see if their live chat shut down and so far it does look like they are 24/7. Would you mind rating LottoZone.com? The site is professionally but clear it only provides access to players who want to play casino games. This is not the place to come and play international lotteries online. Come on Folks – are you Lottery or Casino! Our team gave Lottozone.com a reserved thumbs up. It’s not an online lottery provider though if you want to play casino games, this does look like the place to play. Come on folks – if you’re going to use the title “lotto” then it should be. This site is just simply gambling. Okay, I will give that playing lotteries is a form of gambling but I’m going to stick to going for those mega jackpots like US Powerball or Euro Millions!